£79 Gift Voucher – 1 Day Hire for 1 Canoe, paddles and life jackets. Gift Vouchers can be exchanged for dates between 1st March and last day in September. Dates are subject to the usual availability and should ideally be booked 3 weeks in advance. Available for Pangbourne to Sonning to Adventure only. Gift Vouchers are ordered securely online or on the telephone and will be mailed to the shipping address with all the necessary details for the user to exchange. We will not show the price on the voucher! Are exchangeable within the dates stated on the Voucher. 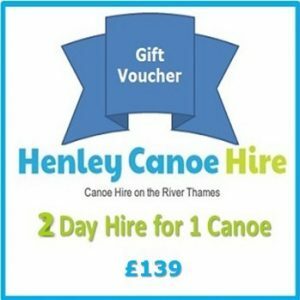 Include the hire of your canoe, paddles and life jackets, drop-off and collection of the canoes – Hirers are responsible for arranging own parking and travel arrangements. Bookings are made subject to usual availability. To avoid disappointment, we would recommend making a booking 1 month in advance to secure your preferred date. 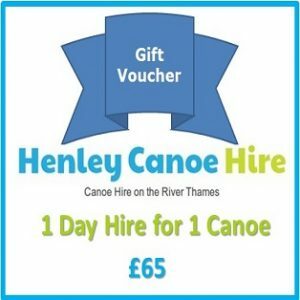 Henley Canoe Hire reserve the right to change locations for drop off and collection without notice for reasons beyond our control and should the need arise will agree a mutually satisfactory route. *We're open during those times at school holidays and weekends only (unless through prior appointment).